All teaching and administrative affairs are coordinated by the Principal, with assistance from two Vice-Principals. Head of Department is set up for each subject. Regular meetings are held to discuss teaching progress, teaching methods, assessment issues, and learning situations. 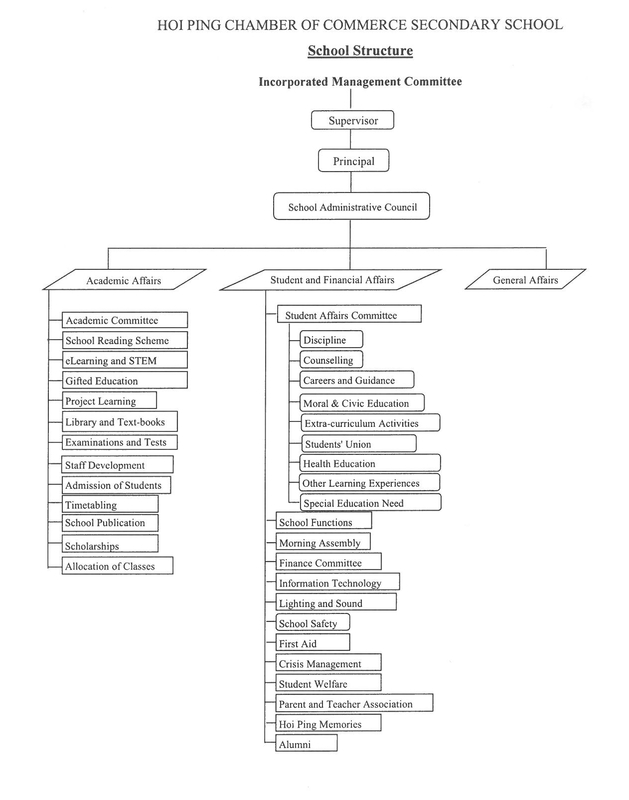 Academic Committee, Student Affairs Committee, Moral and Civic Education Committee, Finance Committee, Discipline Committee, Counseling Committee, Careers Guidance Committee, Extra-Curricular Committee, and other special committees are set up to carry out and coordinate school policies, so that all aspects of students' development are catered for. Regular Meetings are called by the Principal and there is ample consultation among staff to ensure quality education.